Set on 3 levels, an individually designed villa it takes advantage of some of the best views available on the luxury 5 star resort. Set in its own professionally landscaped gardens it is situated in a peaceful location on the Eastern Plateau of the resort. A huge ground floor terrace, ideal for outside dinning and sun lounging, leads to a large 11.5m x 5.5m private heated overflow swimming pool. There is a fully equipped barbecue area and a covered outside pergola ideal for relaxing in. Equipped to the highest specification and furnished by professional interior designers in a contemporary style. Integrated air-conditioning and underfloor heating throughout. 2 flat screen LCD TVs each with DVD, Internet TV, CD player and PS 2. Each bedroom has its own luxury bathroom. There are 3 additional large terraces (one on the roof of the villa!) which are ideal for eating and relaxing on. Supported by on-site property maintenance and management service. We also meet guests on their arrival at the resort and show them up to the villa. En-suite to master bedroom, marble with large shower, bath, wc and double vanity unit. En-suite to bedroom 2, marble with large shower, wc and vanity unit. Bedroom 3 and 4 both served by own individual bathrooms with large shower, wc and vanity unit. Separate lounge with double height ceiling consisting of a 4 seater luxury leather sofa, 2 armchairs and chaise longue. Coffee tables, LCD TV and DVD with Internet TV and PS2. Contemporary style with extractor hood over integrated hob, oven, fridge/freezer, dishwasher, microwave, sink unit and washing machine. Granite breakfast bar with 4 stools. Dining area is open-plan off kitchen with granite table seating 8 persons. Internet TV giving access to many UK channels and movies. The Troodos mountains are a scenic one hour drive. With skiing, walking and cycling facilities. Good ski conditions January - March. 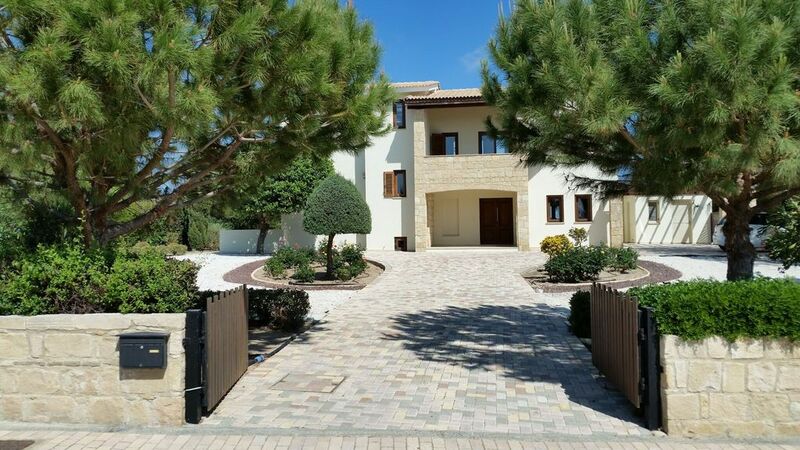 The villa is actually situated on the Golf Course Resort of Aphrodite Hills, a stunning 18 hole golf course, designed by the acclaimed golf course architect, Cabell B. Robinson. The golf course is picturesquely situated by the coast high up over two plateaus separated by a ravine, with magnificent views to the Mediterranean Sea. The challenging fairways cut a swathe through lakes, olive and carob trees. Some holes dramatically run alongside the central ravine and for the par 3 seventh hole, your shot has to take you across the ravine to the green. The sophisticated clubhouse offers delectable Cypriot specialities, international cuisine and extensive wine list with breathtaking views from the terrace, watching the players play over the lake to the 18th green. To hone up your game before your round there is also a 3 hole golf academy, driving range, pitching and putting greens. Nearby (3 kms), is Secret Valley Golf Course and Tsada Golf Course is about 30 min drive away. Outside: Fully professionally landscaped garden overlooking nature reserve with fragrant shrubs, flowers, trees and climbers. Villa screened on all sides. Private rectangular shaped 11m x 5.5m heated overflow swimming pool with Roman steps. Blue tiles throughout. 8 luxury sun loungers, 4 drink tables and parasols for shade. Electric BBQ with sink. Outside covered pergola with 2 luxury patio 2 seater sofas. Covered dining area with dining table seating 8. Large lawned area ideal for badminton. Extensive 1st floor terrace overlooking rear, shaded, with seating for 6 and coffee table. Large terrace overlooking front with 2 arm chairs and coffee table. Large private terrace on top of villa with amazing panoramic views which is ideal for private sun bathing. Outside lighting with pool lighting and spotlights on feature Olive trees. Car port pergola at front. Cleaning on departure, towels, swimming pool towels and linen included. Change of laundry during stay depending on length of stay. Electricity included. Pool can be heated at an additional cost of £200 a week. Other: Outside bathroom near pool area consisting of large shower, wc and vanity unit. Fantastic villa, absolutely perfect. We'll definitely be back. The tennis academy on site with 4 floodlit courts provides courses for all levels and will arrange games with players of similar levels. The Aphrodite Hills Spa is beautiful and was recently voted best spa in the Eastern Med. Horse riding is available, lessons and riding trails for all levels of experience, just 15 mins up the valley from the resort. The beach resort is accessible by car or courtesy coach from the hotel. Opposite the resort is a wild and beautiful piece of coastline which now boasts 2 wcs and a beach look out. Nearby beaches can be found at Pissouri 10km and Paphos 25km. Travelling further afield you can reach the beaches of Kourium Bay and Lady's Mile both are sandy and extensive and suitable for all types of water sports. Nearest airport Paphos 8km or Larnaca around 70km. Limassol is a passenger port from which trips to Egypt, Israel, Syria, Lebanon, Rhodes, Athens, Istanbull etc can be arranged. A hire car is essential for your stay. Geroskipou with banks, supermarkets 15 mins. Paphos 20 mins, Coral Bay 30 mins, Pissouri Village 10 mins. Limmasol 30 mins. Aphrodite Hills Golf and Leisure Resort and new Village Centre has shops, restaurants, bars, Intercontinental Hotel, tennis, gym, and fully equipped Spa with heat rooms and treatments all in themed surroundings, including outdoor pool and heated jacuzzi overlooking the sea. Children's activities available plus weekly family fun day and daily kids club. Booking Notes: Please check availability chart and email with required dates, duration, number of guests, children's ages. Notes on prices: Prices are for the property per week in UK Pounds. Discounts may be available for under occupancy outside of high season subject to availability and demand. Any durations, ie. 9/10/11 nights, can be accommodated and will be pro-rated subject to availability.